Today I am interviewing the talented, prolific, and beautiful mother/blogger/author Jean Van’t Hul. Her blog The Artful Parent is one of my go-to blogs for art, creativity, parenting and just…reading! I love everything she writes about. The childhood wonder and connections that she creates for her girls and then shares with us is really quite magical. This week she released her second book called The Artful Year . I was lucky enough to snag a copy and today I am here to say that the book is as lovely and filled with joy as I thought it would be. It is a treasure. 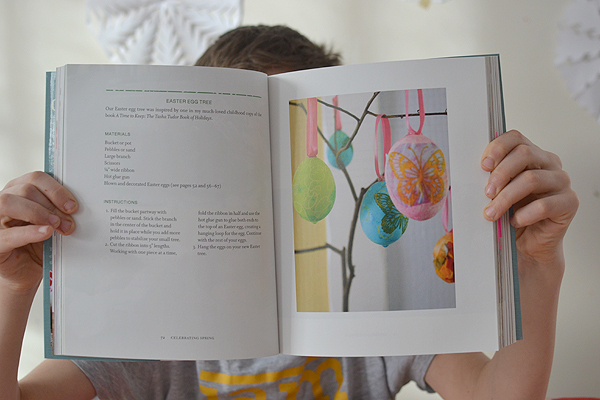 The book celebrates the four seasons with art, crafts and cooking. 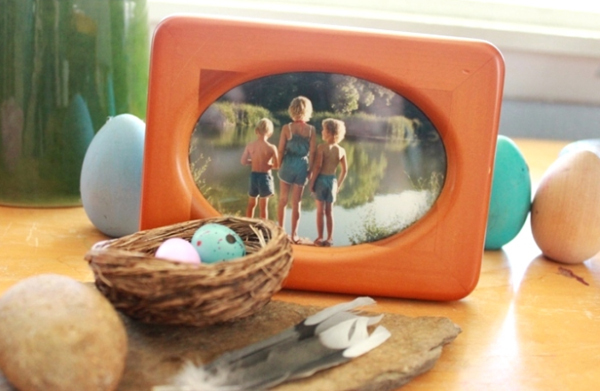 There are so many wonderful and simple projects to do with your kids. I wish I wish I had this book when mine were little! 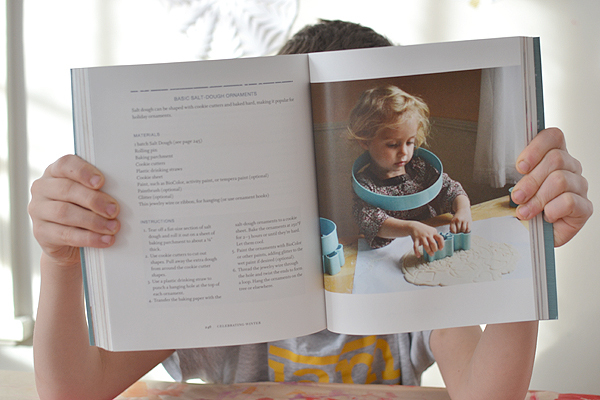 But even now, I made her chicken soup recipe on the day I received the book, and this weekend we are going to make some coffee filter snowflakes (coolest tutorial in the book). So it’s not that it’s just for little kids…it’s more that now that mine are older, they are never home! Ok, so let’s get to the interview and learn a little bit more about Jean and her daily life. I’ll also be showing you some of my favorite pages in her book, along with photos from her blog. BAR: Jean, I have admired you from afar for quite some time. I have your first book, The Artful Parent , which I literally read from cover to cover. And now there is a second book. Wow! Could you please tell me about a day-in-the-life of Jean Van’t Hul? What does your schedule look like? How do you find time to write a book amongst the busyness of blogging and mothering? JEAN – I’m the kind of person who feels claustrophobic in a schedule and much prefer to do things on a whim, but for all that, I have structured my days so that I work when I’m at my best. I’m a morning person times ten. I’ll get up to write and think in the peace and quiet before everyone else is up. And I like to write longhand—it helps me to think and write better—which means that I essentially write everything down twice. First when I write it out in my notebook and later when I type it up on my computer. I do this with blog posts, newsletters, articles, and I did it with my books. As for how I find time to write a book, the answer is not easily! Writing a book is such a big undertaking! It’s hard for me to let go of the urgent daily responsibilities (of blogging, housekeeping, etc) for the longer term goal of writing a book. I wrote much of my first book sitting in my car in various parking lots with Daphne (who was an infant at the time) asleep in the backseat. And I also write and think surprisingly well in noisy coffee shops. 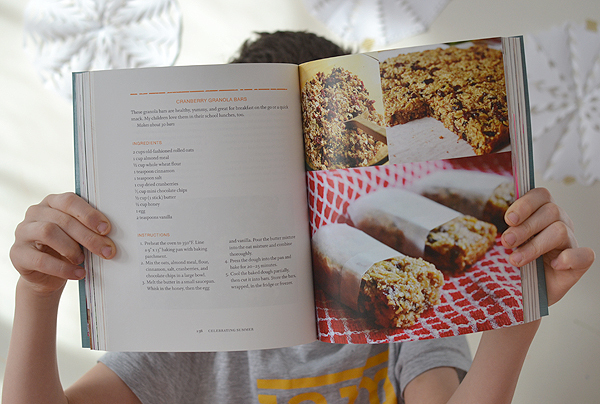 BAR: You have so many delicious and healthy recipes in this book! Do you cook dinner every night? Getting a meal prepped and on the table is definitely my biggest challenge. JEAN: Ha! Well the short answer is I don’t. I am definitely dinner challenged. And, if you look closer, you’ll notice that many of the recipes in The Artful Year are actually (insert embarrassed cough here) baked goods and snacks. 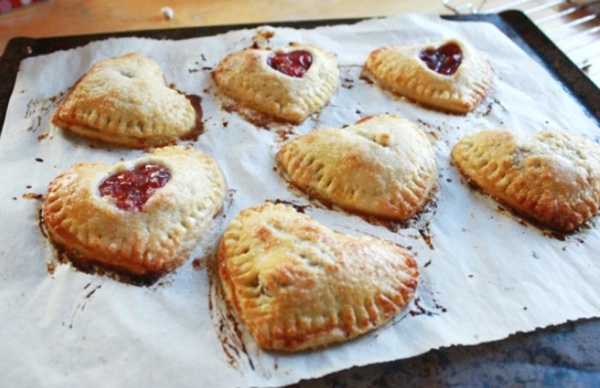 I’d rather bake (and eat) cherry pie than dinner any day of the week. BAR: There is so much creativity going on at home with your girls. Did you do art with your mom growing up? What are your best memories of childhood? JEAN: My mom let us be kids which I appreciate so much now. Our childhood was very unstructured—lots of time for free play, kid-led creative activities, making things, etc. We lived in the country when I was little and in a small western town when a bit older and in both places we had the freedom to roam. I think that’s what I remember most fondly from childhood. When we were little we’d explore the woods around us as a pack (my brother, sister, and I as well as sometimes visiting friends) and when I was in Jr. High and High School, I’d bike 5 miles out of town to a local reservoir and read surrounded by the quiet busyness of nature. As for art, my sister and I were always making things—drawing, painting, crafting, sewing clothes for our dolls and ourselves. My mom had her hands full raising three kids on her own but she gave us the materials, encouragement, and classes to do what we wanted to do. BAR: I know from my own experience that my kids don’t always want to do art with me. In fact, it’s why I started teaching in my house. Their interests are not the same as mine! Do your girls ever not want to do art? How do you draw them in when (or if) they are not interested? Do you do art every day? JEAN: Oh sure! There are plenty of times when they would rather play than do art! And (in general) that’s fine with me. I like to see them doing what they enjoy. Maia, my 9 year old, is into gymnastics, piano, animals, baking, and science experiments. Daphne, my 5 year old, still says she wants to be an artist when she grows up (something Maia used to say) but I don’t necessarily expect her to hold on to that. 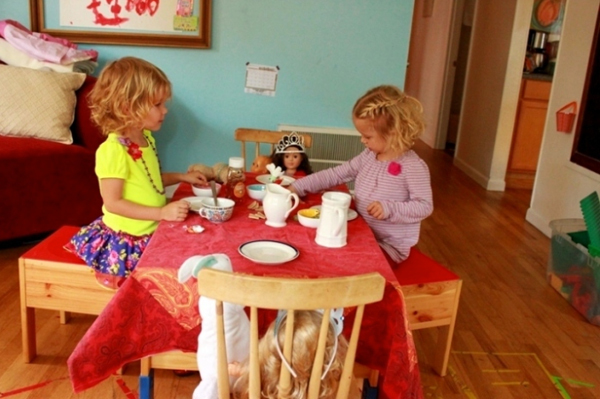 She also loves pretend play and all things princesses. For now, both like art and creating things in general, but might not be in the mood for it when I am. And that’s okay. We don’t have to create at the same time or do the same thing! They will usually join me at the table if I set up a project. And if they occasionally don’t, I’ve been known to thoroughly enjoy creating something on my own. We don’t do art together every day but there is some level of creativity and creating going on in our house every day. We certainly do do quite a bit of art in our home, between the activities we do together, the child-led art that happens in the studio (or chalkboard, sketchbook, table, fridge…), and my own new daily sketchbook habit. 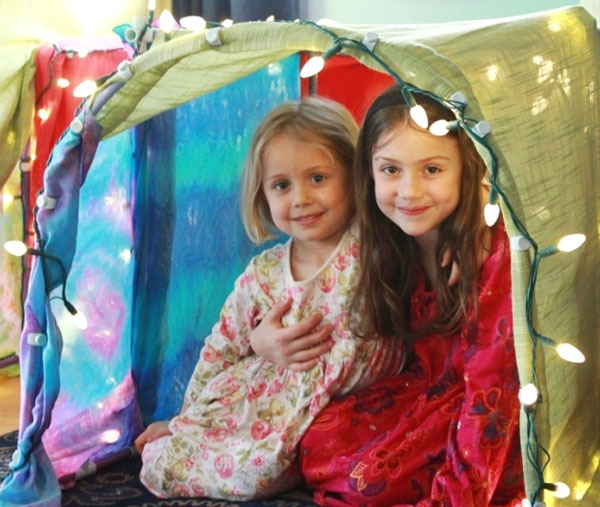 In addition, there’s creativity in many other forms—all kinds of pretend play and creative construction, cooking, making costumes, making up and playing games, singing, dancing, making cards, decorating packages, etc. If I want to entice the kids to create art, I might try strewing, playdates (their friends almost always want to create art and my kids want to be doing what their friends are doing), new art materials, new art techniques, and using their interests as starting points. BAR: As a mom with two daughters (and a son at the end who sometimes acts like a daughter) there is a lot of fighting. Do your girls fight? If yes, what is your top strategy for dealing with sibling rivalry and fighting? If no, lucky you!! Please tell us your secret. JEAN: Of course! My daughters love each other and have so much fun together but they know how to push each other’s buttons as only siblings do. I can’t help you with strategies though! Sorry. I’ll take any you have to offer! Siblings Without Rivalry is a book on my to-read list and I’m starting this siblings tip jar (as of today!). BAR: We are in the middle of winter right now in Connecticut (and lots of snow). 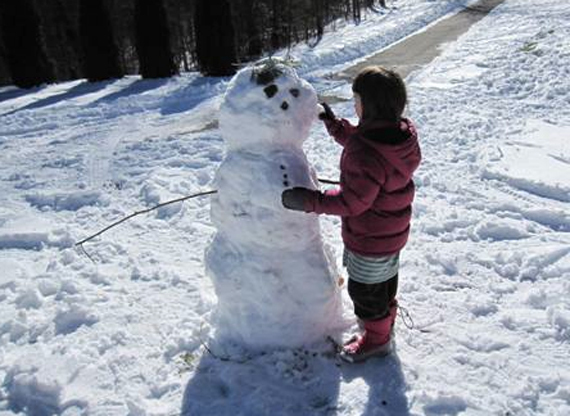 What is winter like where you live in North Carolina? JEAN: I know firsthand what winter is like up there! I lived in New England for a several years during and after college. The winters are long! Winter is still winter here in the mountains of North Carolina but not as harsh or long. I like that we get all four seasons, but they are moderated by our latitude and altitude. 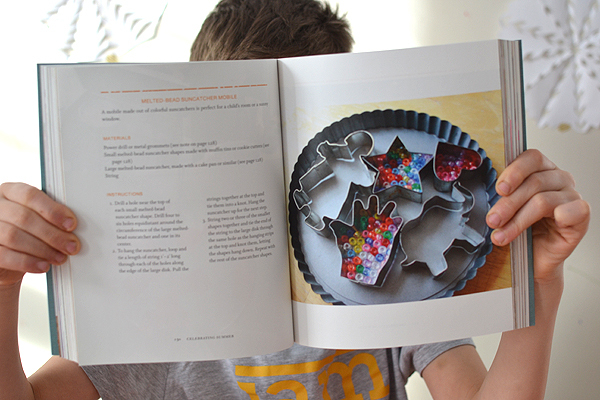 BAR: Your book is about celebrating the seasons as a family through art and creativity and cooking. What is your favorite season and why? JEAN: Spring! For sure. I love the return of warmth, the longer, lighter days, the rebirth of the world around us. All the new green leaves, the flowers, the birds, everything, makes me high on life. Plus, I’m an April baby, so it always feels like my season. Oh, and Easter candy is my favorite and I think half my good memories of spring are infused with a pocketful of little chocolate Cadbury eggs. To me, spring is about long walks, oh-so-welcome sunshine, Banana Yoshimoto books, the world in full bloom, and hours spent barefoot in the garden. Wow! I just learned so much, Jean. I love that you don’t have a strict daily schedule and that you catch free time to write when you can. It’s sort of how I do things, too. Having that early morning time is such a gift. I can’t say I have that myself, but I can see how it would be a lovely way to set the tone for the day. I also love what you wrote about your childhood. Free and unstructured time to play is the way all of our childhoods should be! It makes me rethink our own hectic after-school pace. Thank you for your many doses of wisdom! And now for the giveaway! Just leave a comment here and your name will be entered to receive one free copy of The Artful Year . Deadline to enter will be Saturday, February 21st at midnight. Participants can be worldwide. 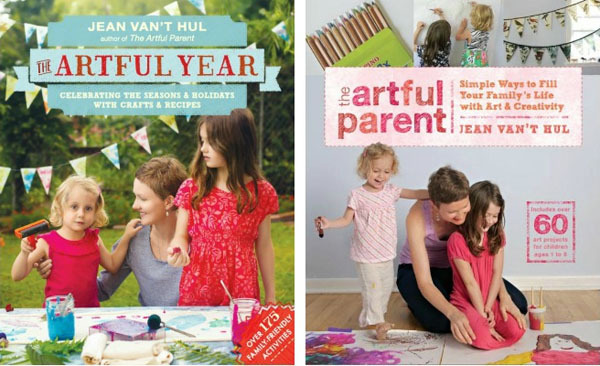 Find The Artful Year and The Artful Parent on Amazon, or at your local bookstore. UPDATE: This giveaway is now closed! Congratulations to the winner!! Jean’s blog is one of my very favorites! So refreshing! Can’t wait to see her book! I have loved following Jean’s art suggestions. She has wonderful and “doable” ideas! Thank you for the chance to win. What a wonderful book! I’d so love to have this on my shelf. I follow Jean on Instagram and Facebook, and am always encouraged and inspired by her posts. Not to mention the amazing amount of colour she adds to my newsfeed!!! I would absolutely love this book. Can’t wait to check it out either way! I love The Artful Parent and can’t wait to read this one! I love The Artful Parent, so I know The Artful Year will be just as spectacular! I’d love a copy of this book. My 3 year old ADORES Artful Parent! She’s always pulling it off the shelf and demanding to do a new craft! I love The Artful Parent blog and can’t wait to read this new book! Thank you for doing this giveaway! I am really excited for The Artful Year and would love a copy. I really enjoy The Artful Parent blog! As an art teacher I have been inspired by your ideas and find them very user friendly. Would love to have this book as a resource for my 480 students. Thank you! It’s funny…I’m sitting here with my copy if Artful Parent in front of me and then see this post! Ha! I LOVE this blog and your books are amazing! Would love to win a copy of Artful Year! 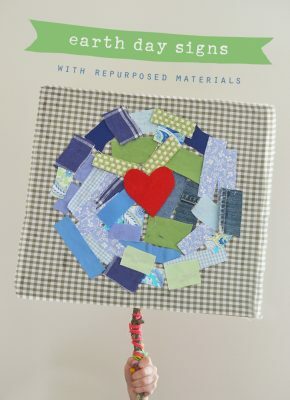 I’m a new follower of Jean’s, but I’ve already added both of her books to my Amazon wish list 🙂 I’m looking forward to using her techniques and projects more and more as I encourage my kids to express themselves creatively. Thanks for the chance to win a copy of her newest book! 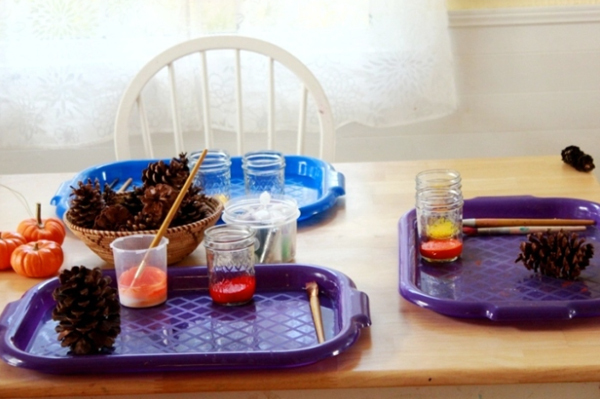 Love the Artful Parent blog! Love this post!! I try hard to do creative things with my kiddos often but a little inspiration could really kick me into high gear!! I just found her fb page and love, love love it. I have been so inspired to do more art with my almost 2 year old!!! I love Jean’s blog. My daughter and I have made several of her crafts! Can’t wait to check out the book. Oh, I heard about Jean before and love her works. I would love to win this book to incorporate more ideas into my art class. Thank you so much for the giveaway and the chance. We would love this book. It looks full of inspiration! Absolutely love the Artful Parent and have used many of her ideas with my students! Would love to have one of her books! Great interview. I would love a copy of the book! (This doesn’t need to be an entry as I have this lovely book already 😉 ) Thanks for the interview with Jean, I like learning how other moms make it work, and glad you enjoyed my quote. Great to find your blog! I would LOVE a copy of this book!! Her ideas are so wonderful. 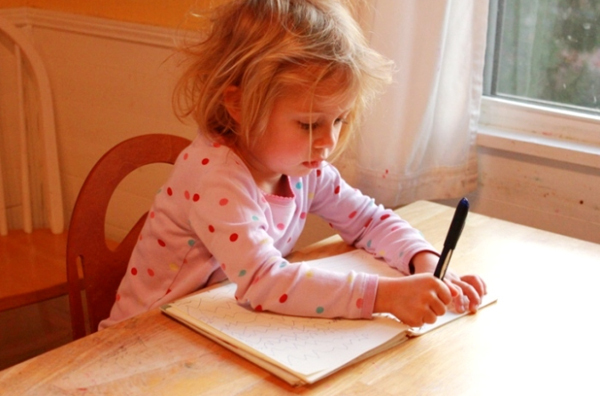 And I love that she writes longhand – I do the same! I’ve been looking for something like this for so long, really want to do fun stuff with the kids! This book will be a real treat to get a hold of! Thanks for the opportunity!! Loved reading this great interview. Jean is a total inspiration to me and I find it fascinating that she longhands everything, including posts! 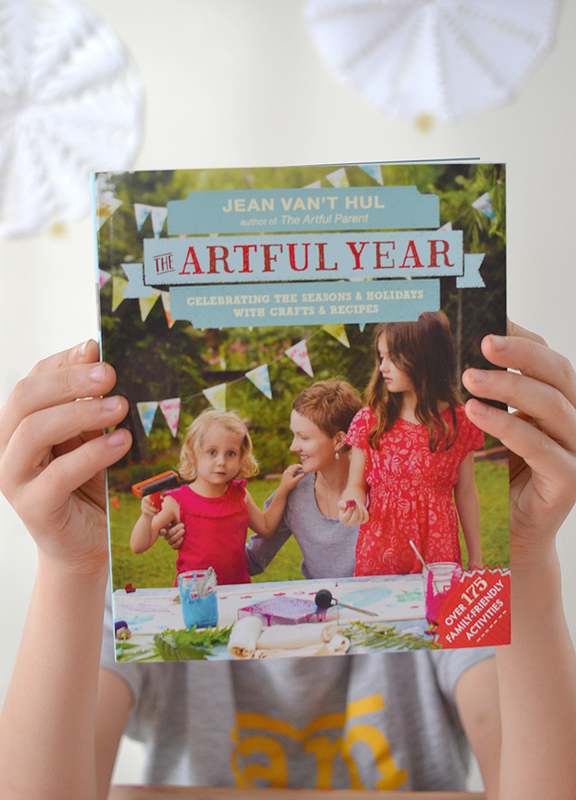 I have a copy of the Artful Year and we love love love it! Can’t wait to check out this book! I’d love to use this books on stormy indoor days and at school with my students. Art and creativity make the hours fly by. What a lovely interview, and a great-sounding book. I loved The Artful Year too. Jeans blog, The Artful Patent, is my “go to ” for ideas and creativity. Genius! Every project is a big hit!! Lovely interview. The Artful Year sounds like a wonderful book, but that’s no surprise. I loved the first book too. 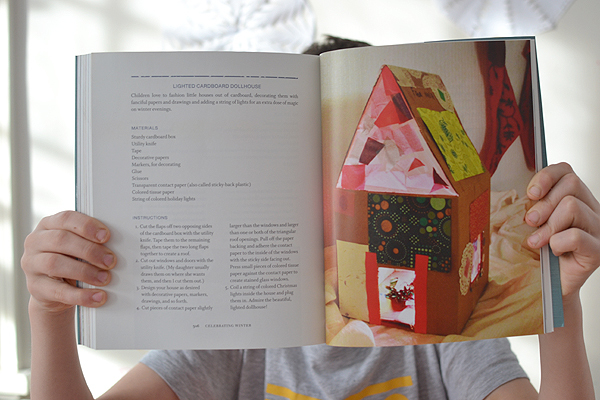 I love The ArtfulParent and would absolutely LOVE this book! Thanks for the opportunity to win! This book looks amazing! This looks like a great book to do with my kids. I think they will enjoy all the different crafts. Looks like a great book! We love art at our house. I would really love to win the book. The ideas and projects in the book are awesome. Jean’s website is always my first go to for art ideas for my daughter. 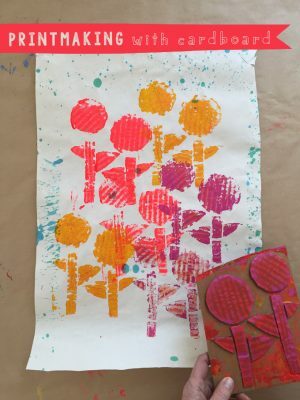 I loooove the artful parent blog! i get so much inspiration from Jean and the projects she does wwih her kids! it keeps me motivated to be an artful parent myself! (even though im not very artistic)! Her playdough tips in particular have saved me on multiple occasions! my kids are little (1 and 3) but doing art with them is what i look forward to most. thanks so much for helping me to think more about what I can do with my children. Since reading Artful parent blogs on facebook, we have created an art studio which my daughter is so proud of and love to work in. I feel so inspired, and so do my kids! would love to take advantage of its content for my family! I’m a fairly new mum and a friend recommended Jean’s blog to me. I don’t want to wish LO’s life away, but already have seen so many ideas I’d love to try with him when he’s older! Thanks for the inspiration!! Wow, what a fun mom!! Oh I would just love to win this book. 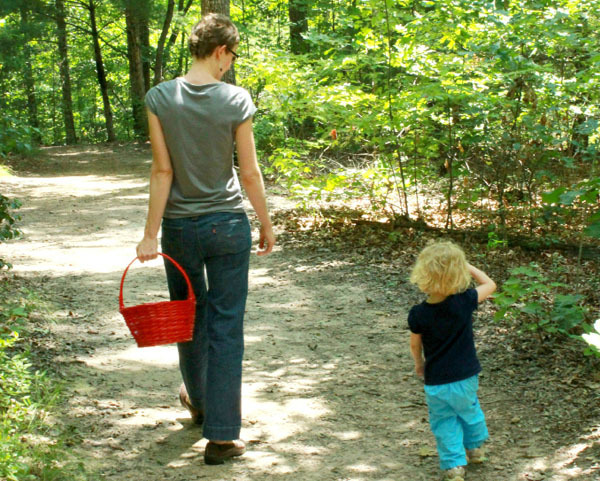 I really enjoy the Artful Parent blog and it is the one I read most often these days. I find it very inspiring! I’m such a huge fan of The Artful Parent! Totally Awesome! Would love to win a copy of Artful Year! What a great interview! I will try to practice being an early bird. I have Jean’s first book and it gave me so many ideas. My kids didn’t like to do art with me before. Now they get very excited when i bring the water paint to the table. yay!! Thank you for the opportunity to win a copy of this book. I have been wanting this book. Lovely interview! I adore my copy of The Artful Parent and would love to add this new title to my collection! Thanks so much for the inspiration Jean! Hi, I do a weekly craft program at a public library that accompanies a storytime. So, I am always looking for good arts and crafts projects. I follow Jean, as she does authentic art projects, that focus on process as well as aesthetics. I always like how she incorporates nature into her projects. As we look to the seasons to teach and inspire children, her book should be extremely useful. Beautiful blog! Beautiful book! I would love to have this in our home! Thank you for the opportunity ! Thank you for a wonderful interview! Love everything about Artful parent and follow the blog and Instagram a lot ! I’d love to use this book for stormy indoor days with my family and at school with my students. We’re excited to read The Artful Year! Looks wonderful. I love her blog and first book, and would love to have this book! This book would get a lot of use in my home! I love Jean’s blog. Very user friendly for those of us who are not particularly artistic. I am excited to see her new book! I am a working mom, and Jean’s blog help create memories … Thank you. This book looks so amazing! I’ve been following Jean’s blog for a while and she always has great ideas! I am so excited for Jean’s book. 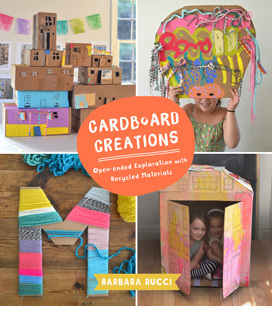 I have been following her blog and always find inspiration for creativity with my children. Love her blog and can’t wait to check out this book! So fun and inspiring. I’m excited about this book, and glad to have found your blog. Thanks! I’m a big fan of Jean and her blog, I’ve been following her for years!! I woud love to win this book!! Inspired by her blog and by yours, especially during all of these snow days. Thank you! I love your post! Great images and it appears to be a fantastic book. Jean’s projects are awesome and I look forward to trying them in the future! 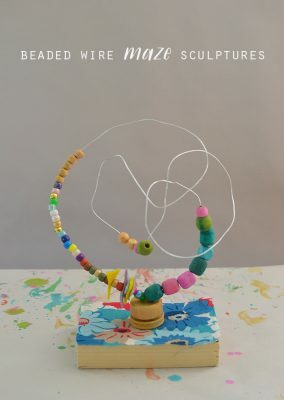 I love Jean’s blog and have tried many of her art projects with my daughter, and both of us always have fun. 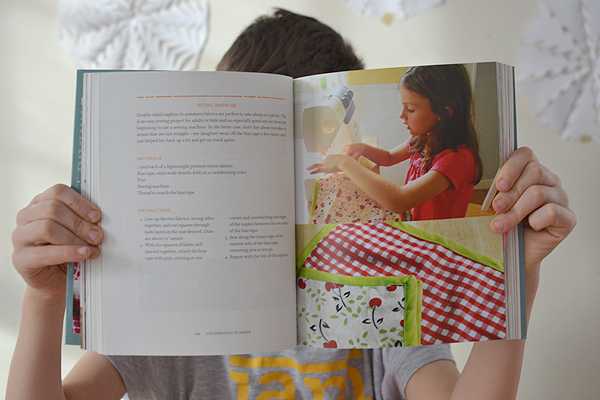 I’m checked out her first book numerous times from the library and am excited about her second book as it features recipes as well as art ideas – cooking is one of my favorite activities to do with my daughter, as well as art. Thank you for the chance to win! Wow! This book looks SO cool! I’ve been following Jean’s blog for a few years now, so many good ideas. Jean offers such great ideas that are easy. Can’t wait to read her new book. I’m just beginning to embrace craft again, in a way to give me something to focus on other than work, and your book seems like a lovely place to start 🙂 Thanks for sharing your ideas and projects, these are great! When it comes to books of creative ideas, I have a few favorites, some of them my own, LOL! But seriously, “The Artful Year” is truly amazing –– I LOVE IT!!! 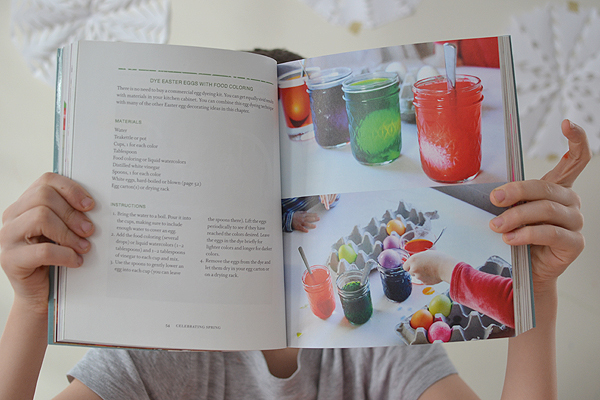 I’m not usually so taken by a book, but this one is really beautiful, easy projects, colorful, delicious, creative, all of the things you want. Another fun idea. Join our process art group on Facebook. Every day there are photos and ideas and videos. I think it’s the best group I’ve ever been in. See you there! I love the Artful Parent and am sure this book is just as good! Thanks for the inspirational book and post! I’ve been reading Jean’s blog for a while and love it! Thanks for sharing. Great interview! These look like great books!